Made for general use, no need for professional electronic training or knowledge. With LED Light Detection, Audio Detection And Vibrating Detection Modes. The all new generation CounterTEK Basic Vibrating mode bug detector gives you a mode selection of silent LED light alert, silent vibration alert and/or earplug audio alert modes. It's designed for fast portable countermeasures sweeps that will detect from an amazing range of between 50 MHz to 6.0 Ghz. Three LED's alert you to the presence of hidden cameras or wireless bugs and taps. In audio mode, the audible alarm will change from slow to rapid indicating the strength of detected signal. In vibration mode, the unit will silently vibrate alerting you to bugs, taps and eavesdropping equipment. Beeper sized, the unit is small enough to fit in your pocket. Because of it's different modes of operation, it's really two bug detectors in one. You can use it as a conventional countermeasures sweep unit. However, you can also place it in your pocket on vibration mode and use it as a body type detector. When it detects eavesdropping, it silently alerts you by vibration. It's important for you to understand advanced features and NOT be fooled by cheap knock-offs and look-a-likes! While there are a number of cheap bug detectors on the market that look much like The CounterTEK Basic, they do not have the features, nor the range of this unit. Not only that, with a lot of them we have tested, they are almost impossible to use as you have to be within less that six inches of an eavesdropping devise to pick anything up. This unit is very sensitive and can pick up eavesdropping from as far away as 20 feet! • Detecting distance for 2.4GHz wireless camera is about 5 feet. • Detecting distance for 5.8GHz wireless camera is about 2 feet. • Detecting distance for cellular phone is about 20 feet. • Catching all the Hidden camera and Concealed microphone. • Hunting all the Cellphone, Wireless phone. • 3 LEDs indication: Level 1 (Weak), Level 2 (Medium), Level 3 (Strong). • Sensitivity tuner for Distance adjustment. • Switchable sound / Silent detection. • With earphone to detect without other's notice. We know you will be extremely happy with the multifunctional features of this new generation bug detector which will serve your countermeasures needs well in a multifunctional way! 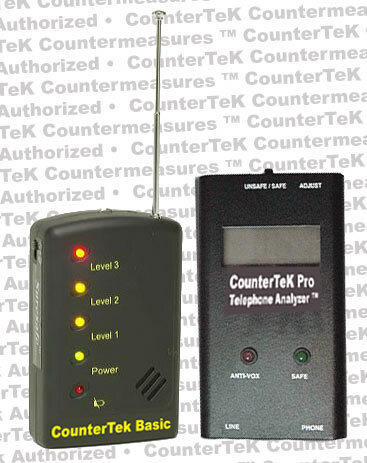 You can obtain this state of the art CounterTEK Bug Detector by itself at a low low price or save even more with the CounterTek Pro Telephone Analyzer that goes with it in a super countermeasures combo special! Sweep A Room And Sweep A Telephone Line For Bugs And Wiretaps! Use CounterTeK Basic Bug Sweep To Sweep The Room! Then Use CounterTek Pro Telephone Line Analyzer To Sweep The Phone And Phone Line! Easy-Quick And Simple!